Venice Beach Neptune Festival - Yo! Venice! 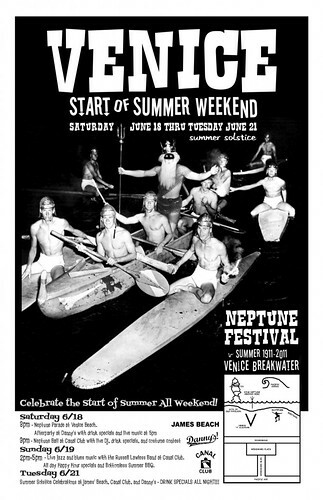 The first annual Neptune Festival will commence this Saturday, June 18th starting at 3 p.m. 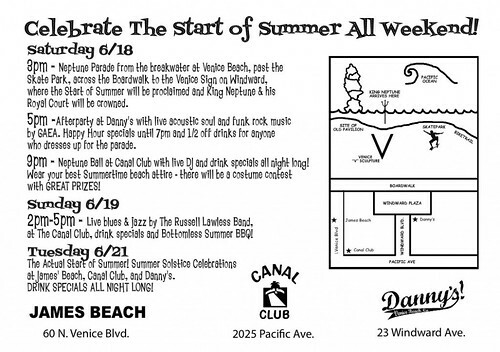 Participants are asked to meet at the Venice Breakwater, where costumed (including you!) Neptune festival participants will parade from the ocean to the Venice sign on Windward, where King Neptune will declare the beginning of summer officially here. Drink specials (1/2 off for anyone in costume) will be had at Danny’s Deli after the parade as well as a follow up party in the evening at the Canal Club with a DJ starting at 9pm. More info after the “jump”.